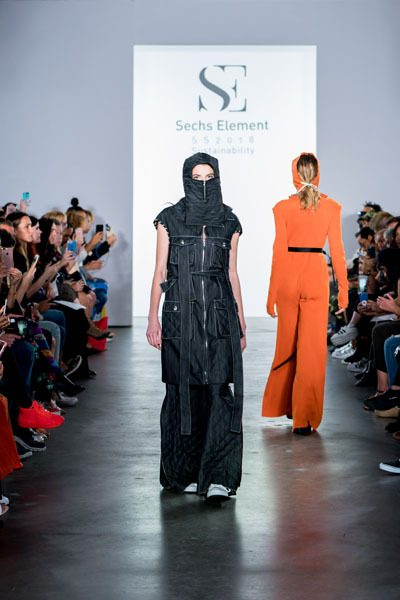 On September 7th, the first day of New York Fashion Week, Sechs Element showcased seven sustainable fashion collections by emerging fashion designers from around the world. 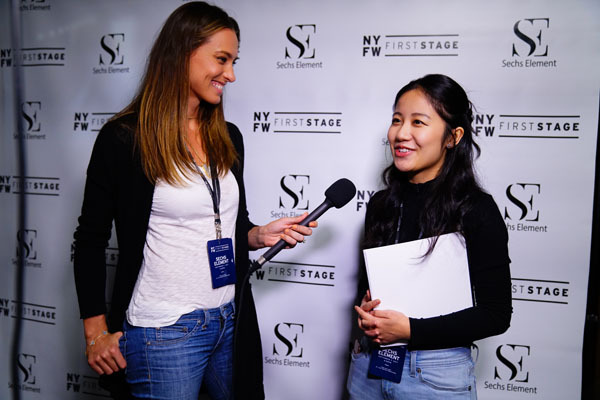 The Chinese firm based in New York City and Beijing, provides support to emerging designers who are passionate about instilling change and new ideas into the fashion industry. 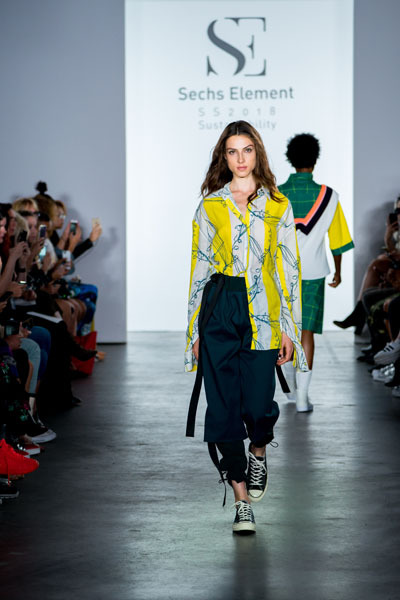 The fashion show was their first in the United States and took place at IMG New York Fashion Week: First Stage. 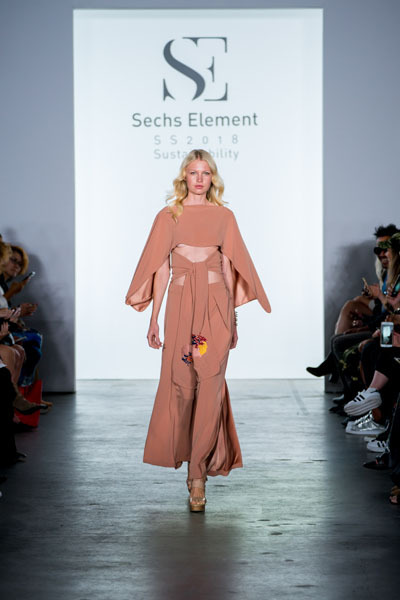 Featured talent selected by Sechs Element from applicants from around the world included Alice Potts (England), Apoorva Gupta (India), Cen Si (Finland), Peiyang Zou (China), Chenhui Zhang (China), Jiaren Du (China) and Daria Lutskevich (Belarus). 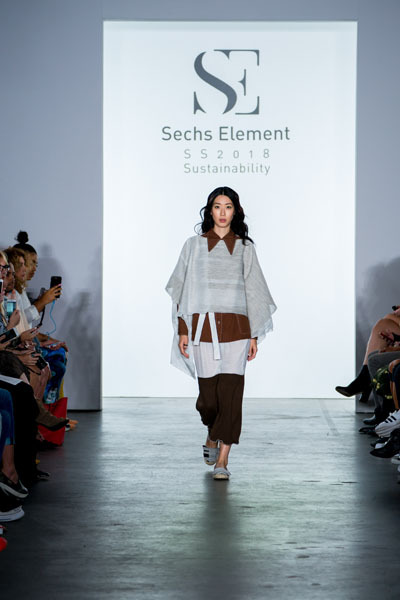 Founded in 2016, Sechs Element’s mission is to further awareness and education of sustainability in the fashion industry with a focus on China. 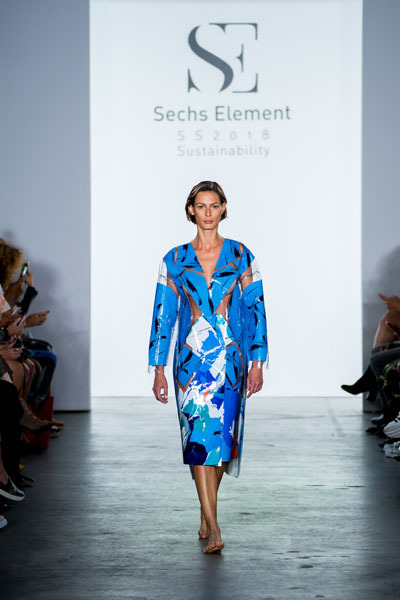 Taking a leadership role in spreading the message of eco-consciousness, the firm will reprise its debut fashion show in China following NYFW, educating students and fashion industry professionals on sustainability resources and practices. Each of my pieces are exactly the same squares interlocked in different material. Each garment consists of 150-600 squares that can all be slotted together to create a whole garment, the idea being that one base of a garment can turn into a multiple of items such as jackets, dresses, trouser or handbags from the same number of squares. My customer would only need a set number of squares that can be changed into endless amounts of garments. Waste is a human invention and as it is up to us to design it out of the system. My collection focuses on being sustainable as all the pattern pieces have a function and fit together like a jigsaw puzzle, eliminating any waste. My collection reflects distinctive, fashion-forward clothes. My silhouettes are simple yet versatile and can be worn in multiple ways. Some of my pieces are even reversible. I believe that zero waste garments increase the value of the garment making it longer lasting and reducing the shopping frequency which further reduces the waste associated with the production. As a pianist and composer who studied music since I was young, I use a unique system to translate my musical compositions into fashion, incorporating technology and digital interaction to connect the boundaries of music, performance and fashion. 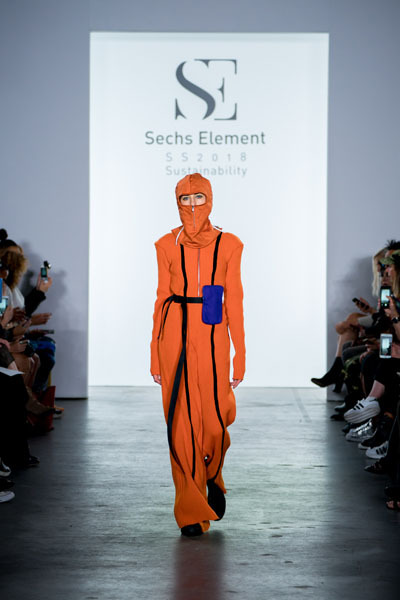 With a heavy focus on print, design and color, I used a rich color palette in my collection to create a quirky, slightly athletic style inspired by my musical compositions – expressing a story about my childhood in Finland the same way an unpolished tune is transformed into a beautiful, complete piece. Through storytelling I am able to connect the clothes with a deeper in relation with culture, history and customers. In SS18, I want to focus on sustainability and production transparency. This season’s story is one of consumerism, emphasizing 1990s Chinese workwear with historical references of sportswear, tailoring, and vintage workwear. For each piece, customers will have a direct and correct idea of what, why and how the pieces are produced. In my opinion, the excess waste in the fashion industry is produced through the lack of emotional connection between customers and products. By creating a story that is transparent, storytelling is my way to solve the problem of excess waste. My concept is about ‘reconstruction’. I have gathered and recycled horsehair, which is commonly used in tailoring pieces, and cotton gauze, which is fundamental to everyday care. These massively produced and overlooked materials lost meanings in the fast-paced industry and became unwanted. My goal is to bring attention to over-consumption and give these materials new meanings. I am also using hand-made and ethically sourced fabrics from my hometown, quite the opposite idea of excessive consumption, to explore materiality and bring attention to sustainability. My idea is about when people want to dispose of their garment, they can take it apart easily and recycle them. In this collection, “The Walking Art”, the construction is about putting the printed paper and solid texture between two layers of clear plastic, giving an effect which looks like using the garment to exhibit art. And I use staples instead of the sewing machine to put all layers together. In my color story, I use different shade of grey to represent the pollutions; however, I also use light and soft spring colors to represent the beautiful lands.